This main palace is located at the center of the city in a walking distance from the city center. You must visit this beautifully designed palace and its adjacent museum. Once the residence of Wodeyars this beautiful palace was built in 1912 is a treasure house of exquisite carvings and works of art by Raja Ravi Varma and others. Mysore Dasara celeberation is world famous and the Throne is available to see for all visitors. During Dasara, a procession will be held (also called Jamboo savaari) from main palace to a place called Bannimantapa. The idol of goddess Chamundi will be carried on top of the elephant. The palace is to be seen with its illuminations during evening hours. 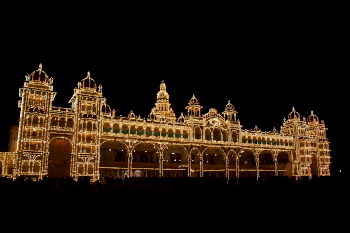 The palace is illuminated on Sundays, national holidays and state festivals from 7:00 p.m. to 8 p.m. During Dasara festival you can see the lights glowing up to 9 PM. The Mysore Palace is open all days of the week, from 10 a.m. to 5:30 p.m. Better check the timings of the palace as we found it closed for a day for Puja just before the Dasara festival. Cameras are not allowed inside the place but you can take photos from outside, better to take your camera and after using it you can deposit at the entrance. 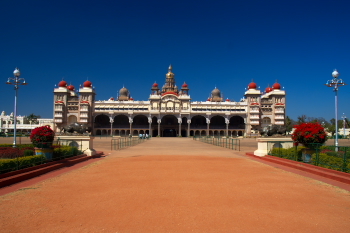 Visit the Picture gallery to view the images of Mysore palace during day and night. 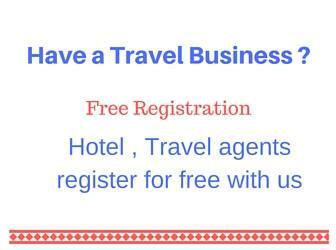 Visit the Mysore home page to get the details of other visiting places in Mysore district.